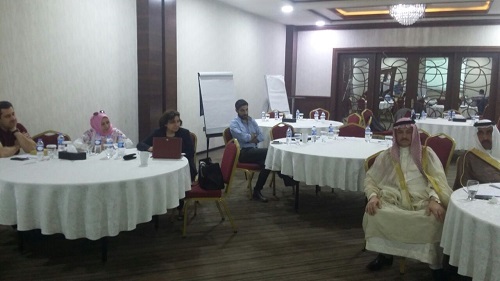 Mrs. Pascale Warda participated in a workshop held in Erbil to draw up a field strategy to counter the effects of violent extremism in Nineveh province. 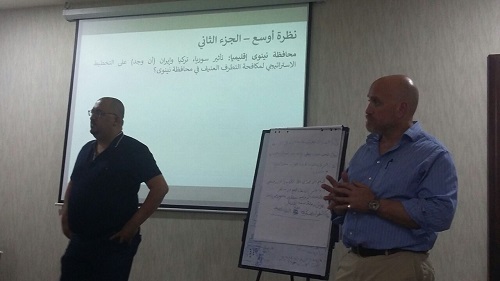 Participants in the workshop discuss the sensitive root treatment of the requirements of eliminating violent extremism, integration and forgiveness. Mrs. Pascale Warda: The adoption of successful civil field programs requires a participatory approach from all components of Nineveh province and a serious political decision-making capacity. Mrs. Pascale Warda, Chairwoman of Hammurabi Human Rights Organization, Former Minister of Migration and Displacement, member of the Iraqi Women's Network participated in the workshop organized by the Sanad Organization for Peace building on 29, 30 April 2018 in Erbil. Participants including number of human rights and administrative figures on human development in various organizations of civil society. 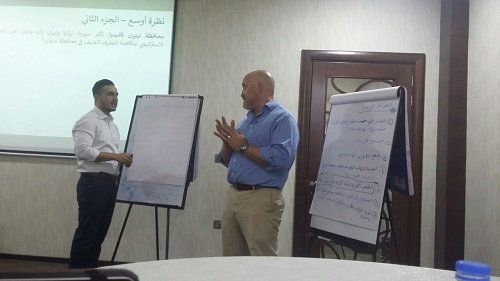 The deliberation focused on the goal of formulating a field strategy to combat violent extremism and the devastating consequences and serious risks in Nineveh province which could be revived if the sensitive root treatment of the requirements of transitional justice, integration and forgiveness is not addressed, and to promote the values of solidarity once again among all population components in this province away from any marginalization or exclusion or isolation. In this regard, the diagnosis required addressing the cause of violent extremism and how to face the necessary security, economic, civil and legal confrontation within the framework of solidarity mobilization involving civil society organizations and field governmental institutions in accordance with participatory plans that do not exclude any population component. Summaries of the conclusions were reached after answering many questions raised in this regard taking into account the peculiarities of areas in the province, and what constitutes the minorities of Christians, Yazidis, Shabak, Kakayis and Turkmans of national weight and balance which must be taken in administrative and developing policies , social and participatory approaches. 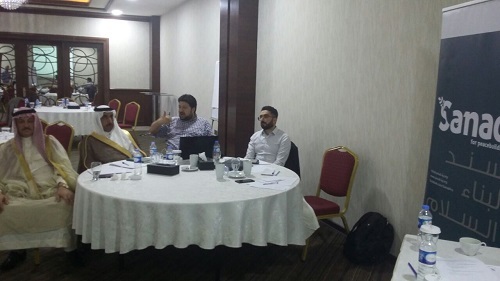 On the second day of the workshop, deliberations were devoted to the mechanisms currently in place, and whether the programs approved in the field is at the level of the stage requirements to remove all the damage and destruction of the province caused by the terrorist groups of ISIS, most of them is still seen. In this context , deliberation was on the relationship between the conditions of Nineveh province and other provinces as well as the adverse impacts on the population of the so-called disputed areas between the Regional government and the Federal government, and the methodology required developmentally ,politically and service from the Provincial Council of Nineveh and the need to address errors before their escalation, adoption of participatory approach in the development of investment plans, plus recognition of the basic needs of the population on the ground. Mrs. Pascale Warda spoke several times during the two days of the workshop, pointing out that her diagnoses in this regard came from a participatory vision of field visits to most areas of Nineveh province through meetings with citizens or through the various relief program implemented by Hammurabi Human Rights Organization In the Mosul and Nineveh Plain areas and other villages and towns of the province, stressing that the existence of a clear and accurate mechanism of action takes into account the needs of the field and re-educate the citizens of national awareness to bring out society from the culture of violence and lifting the obstacles that hinder the policy of flexible respect of human rights and maintenance of the dignity of rights because this is the right way to achieve a promising new civil renaissance in the province. At the conclusion of the workshop it was agreed to hold new sessions after two days and preparations written to develop an integrated program for the plan of field action and civil service in the province.